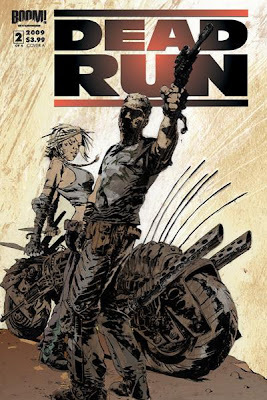 A mini series from Boom that was basically a mash up of Mad Max 2, SpaceHunter, Damnation Alley and those trashy Italian post apocalypse movies of the early 1980s - 'Dead Run' was a blast from start to finish. The plot is as simple and straightforward as those Italian low budget flicks that clearly inspired this series. Nick Masters is a 'courier' - he delivers whatever, wherever in this dangerous new world. He lost a drug consignment that belonged to a 'Mr Big' called Kane and Kane has kidnapped Masters' Sister, and in order to get her back safe, he has to make a 'Dead Run', with a consignment of whatever it is that Kane wants him to courier. Joined by a girl whose Father was a courier who made the 'dead run', they set off into post apocalyptic hell. That is all you need to know. Other than the art is art great and really captures the spirit of post apocalyptic fiction (you know, like customised cars and bad guys in leather, people wearing goggles on their head for no good reason etc). Oh, and the dialogue is B-Movie cheesy and actually adds to the experience. I don't know if a trade is coming out for this - but you can probably still collect the singles. If the likes of 'Y The Last Man' and '100 Bullets' are your big budget, intelligently scripted blockbusters, then 'Dead Run' is your low budget straight to DVD production. But sometimes, all you want is a straight to DVD actioner. 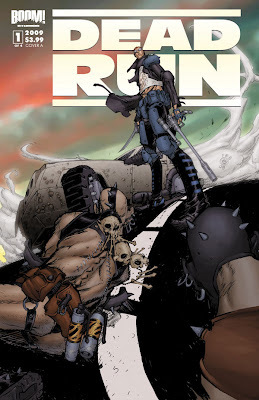 For those reasons, 'Dead Run' makes it to no.10 in my top 10 titles of the year. 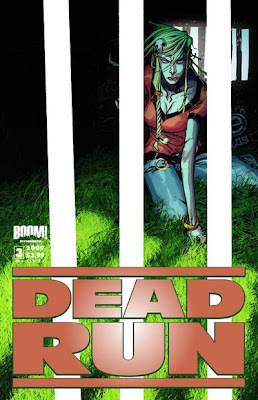 I reviewed the first issue here, and the third issue here.